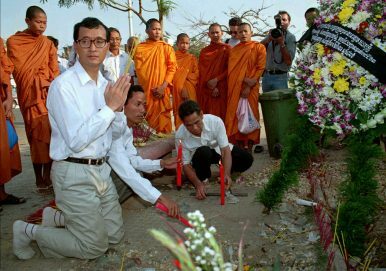 In this file photo, Sam Rainsy, left, offers a prayer to grenade attack victims along with chanting Buddhist monks at the site of the March 30 massacre in front of the National Assembly in Phnom Penh, April 1, 1997. On March 30, 1997, four grenades were thrown into a crowd gathered in Phnom Penh to support rising political star Sam Rainsy. At least 16 people were killed and many more injured, including union activist Chea Vichea, who was later assassinated. Rainsy himself only survived the attack because his bodyguard shielded him from the blast. Like most assaults on enemies of the government, the grenade attack has become an infamous example of impunity in Cambodia. But it has also been a symbol of Rainsy’s commitment to the cause of democracy. Despite this attack on his life, Rainsy continued his crusade for human rights and democracy, even as candidates in his party were gunned down in the streets. “The act was so cruel, callous and barbaric that it made all of us determined to continue. No government ever really stamps out dissent through violence. The human spirit isn’t made that way,” Rainsy said. Eventually Rainsy would form the Cambodia National Rescue Party with rival opposition leader Kem Sokha. The party posed the greatest threat to Prime Minister Hun Sen’s 34-year rule, but was forcibly dissolved to prevent it from competing in the 2018 national election. “He had a fire in his belly. He went out there and organized these protests that were attacked,” Ear said. Ou Virak, a leading Cambodian political analyst, said that Rainsy’s legacy is one of unmatched popularity and influence. “As of right now he remains the only really strong opposition leader, somebody that can actually galvanize and attract young Cambodian supporters,” Virak said. A constant danger to Hun Sen’s grip on power, in 2015 Rainsy was hit with politically motivated criminal charges while traveling abroad. Despite pledges to return, he hasn’t been back to Cambodia since. Although Rainsy remains immensely popular with Cambodians, his continued and extended absence raises questions. While some journalists and political analysts – who have never taken the same risks – suggest that Rainsy is a coward, his record clearly shows otherwise. What’s at stake, however, isn’t Rainsy’s historical record, but his future role in the opposition. That being said, Rainsy has repeatedly pledged to return, most recently claiming he would be in Cambodia by Khmer New Year – a deadline that appears to have been abandoned. Meanwhile, CNRP co-founder and president Kem Sokha is still under house arrest for treason, and the party has begun to split among familiar lines. All Rainsy needed to do was bide his time, but mistakes were made. “Everyone knows he’s not the second coming. This is a man, with all the flaws of being human,” Ear said. In the aftermath of Kem Sokha’s arrest, Rainsy made a few puzzling decisions that have sowed division within the opposition and undermined his own position. He made a public bet with Hun Sen over when Sokha would be released, a publicity stunt that came across as insensitive and understandably infuriated Sokha’s supporters and legal team. Rainsy also declared himself “acting president” of the CNRP, a decision that smacks of a desire for personal glory, especially given that Rainsy was already the de facto leader of the opposition movement. “It was really, really unnecessary,” Virak said. Nobody was more critical of Rainsy than Kem Sokha’s own daughter, who said Rainsy was “destructive to CNRP and himself.” But while Sokha’s allies become increasingly frustrated with Rainsy, many Cambodians remain loyal. For some, the answer to the question of “Who else?” is Kem Sokha. Rainsy’s unwillingness to face prison like Sokha has drawn a sharp distinction for those who believe Rainsy is no longer prepared to make the necessary sacrifices to continue leading the opposition movement. But Virak said this is all secondary to Rainsy’s widespread support and role as an international statesman. *A previous version of this piece identified Lao Mong Hay as a CNRP adviser. Andrew Nachemson is a freelance journalist based in Southeast Asia. Cambodia’s Opposition Begins to CrackCambodian Treason Case Highlights Cold War RivalriesWhat Went Wrong With Cambodia’s Opposition PartyAnti-Chinese Sentiment on the Rise in CambodiaA New Era for Hun Sen’s Cambodia?